Greta with her "Inspired by Colour" presentation. All talks are supported with a display of my own work. FIRE & WATER is the inspiration for a series of pieces which use a variety of techniques and materials, all in some way associated with either fire or water. Includes subjects such as Venice, Volcanoes, and pieces that will hang outdoors and withstand the British weather. INSPIRED BY COLOUR shows how colour has inspired my work with design ideas from many sources. These include the summer flower garden, fishing boats, the city of Barcelona, travels to North Africa, and South American textiles. There are some quilts, but also embroidered wall hangings and three dimensional pieces. Come along on a journey to places such as Venice, Hong Kong, Morocco, Turkey and Spain, as well as local UK travel – places that have inspired quilts, wallhangings and themed Journal Quilts. 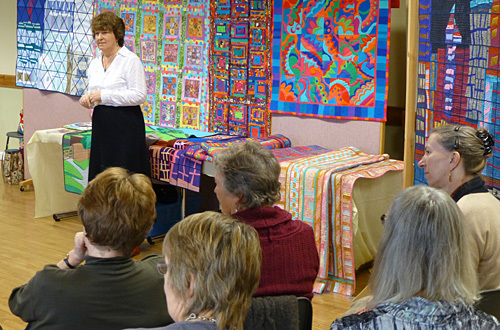 A talk by Mike Fitchett for artists, embroiderers and quilters. At dayschools all techniques are demonstrated with easy to follow samples, and templates are provided. Examples of finished pieces are shown. A materials and equipment list will be provided for students to bring their own items. Please note that all my dayschool teaching is for guilds and textile groups. I do not hold dayschools in my own studio. Please contact me for details of my current dayschools subjects. Having completed the Quilters Guild Judges Course, I am a qualified quilt judge. Talks, maximum travelling distance within 30 mile radius of Derby. Talks and dayschools. Maximum distance within 75 miles of Derby. Please e-mail me for details giving your name, location and telephone number.